We will soon be looking for new governors for our Governing Board. Castle Carrock School will be looking for new governors ready to start in September 2019. Two of these governors will be Parent Representatives – elected by the parents – election dates for this will be forthcoming. There may also be space for community, or co-opted, governors. The governing body would therefore like to take this opportunity to explain what a governor does, and to ask anybody who may be interested in this role to come and have a chat either with Ms Stacey, or Mr Mark Hetherington, the Chair of the Governing Board. As a parent governor you do not have to vote in a particular way because you have been pressed to do so by parents. Objectivity, however, is essential.Parent governors are elected by other parents and it is important to establish a rapport with the parental body that elected you, whilst continuing to maintain a strategic approach to school governance. It is an incredibly rewarding role – and you play a key part in the vision, ethos and direction of the school! Dates and deadlines will be advertised soon. If this sounds like something you would be interested in, please ask to have a chat with Ms Stacey – or one of the other school governors. Code Club is a popular part of our school – allowing children the chance to experiment with coding and problem solving. It is open to any child in Key Stage 2 (years 3 and up) – and takes place on a Monday after school – 3:30- 4:30, children are welcome to go on to after school club after this time. 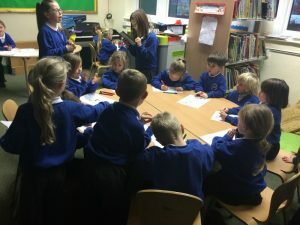 This year our Code Clubbers have led a ‘Mini Code Club’ for children from Class 1 who have wanted to try out some of the activities. Using programs such as ‘Scratch’ and the Hour of Code website! Another area that the school is currently working on is our Mathematics attainment and progression. Maths across the school – whilst meeting national progress targets – is one of our most challenging areas. Last year we worked at ensuring our mathematics curriculum progressed appropriately through the classes and that the children were challenged enough in class. We also looked at our Calculation Policy – which ensured that the children are taught the same methods of calculation throughout the year. Sharing this with parents via the website and in our Parent Maths Sessions has been a key area to work on. This year our emphasis is on consistency across the school – consistency with vocabulary, expectations and resources. As such some of the teachers have already attended training looking at the different resources available and how they can be used across school. We are having a whole school maths day at Talkin Tarn – linked with the Carlisle United Community Coaches who will be supporting us with orienteering and direction work. We are continuing to emphasise mental calculation methods – using Times Table Rock Star from Year 2 onwards – and asking our our older children to solve more calculations with mental methods. Your help is vital for this; the children all have maths targets which detail what they are working on in class. For example in reception it may be about recognising and ordering numbers up to 20 whilst in Year 4 it may be about knowing all of their times tables by heart. Homework as they go through school will also help the children to reinforce learning at home.